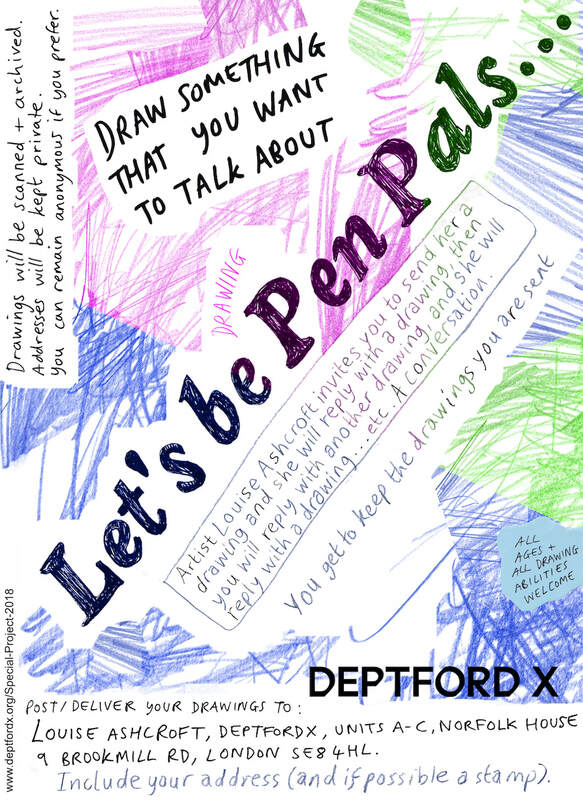 From now until DeptfordX festival in late September, Louise invites members of the public to post her a drawing that relates to their life or something they want to talk about and she will reply in drawing form, beginning an ongoing drawing conversation. The address to send drawing letters to is Louise Ashcroft, Deptford X, Ground Floor, Units A-C Norfolk House, 9 Brookmill Rd. SE8 4HL. Include a stamped addressed envelope if you can (or at least your address). Part of a Special Project for DeptfordX 2018. Each work for the project is based on a couplet of words gleaned from the data protection policy of the festival (an example of the behind the scenes work that goes into running it). This work responds to the words Paper Relationship. Gleaning dozens of surprisingly evocative words from Deptford X’s recently authored Data Protection Policy document, Louise Ashcroft has made a list of poetic couplets, (e.g. Loop Fields, Train Wave, Transparent Forms, Paper Relationship, Stage Harm, Fleshing Board). She will interpret these title-like micro poems by creating performances, objects and experimental social experiences for local communities and individuals, particularly those whose creativity is sometimes undervalued or overstretched - including the festival staff. This might involve jazz running, stargazing, the belly button of a Trustee, and a trip to a birthplace.